The neighborhoods nearby the historic Glenn Dale Hospital have been a vital force in advocating for its reuse and evolution to again serve the community. In a responsive effort to keep stakeholders informed, the Maryland-National Capital Park and Planning Commission and the Alexander Company have launched a new project website. 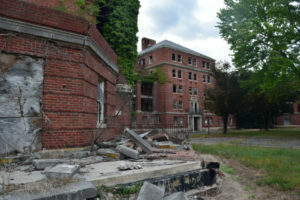 Thanks to Preservation Maryland’s involvement, active efforts to breathe new life in to the long vacant Glenn Dale Hospital in Prince George’s County have taken a major step forward with the selection of a qualified team from The Alexander Company to complete a redevelopment feasibility study. 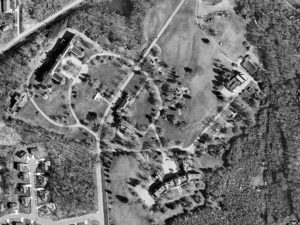 Situated on a wooded campus of over 200 acres in Prince George’s County, the majority of the two dozen Georgian Revival buildings of the Glenn Dale Tuberculosis Hospital and Sanatorium date from the 1930s. Once the area’s largest employer, Glenn Dale hospital was closed in 1981. Vacant since, and a bit of a white elephant, strong community efforts have pushed this project along to rehabilitation and reuse.